Mount Fairweather was carved out of the bush in 1965 and 1966 by brute force, determination, and charity. In the winter of Canada’s Centennial, Mount Fairweather fired up the T-Bar and rope tows and welcomed the first skiers to the greatest vertical drop in the Rainy River District. The years since have produced regional champions, nationally sponsored racers, and even a member of the Canadian World Cup team, Ms. Lydia Kutra. Lydia has been honoured by having our signature run named in her memory: the Lydia Kutra Challenger. Atikokan’s indomitable spirit made Mount Fairweather a reality in 1967 and that charitable spirit has persevered though many challenging times since. For over 40 wonderful years Mount Fairweather has remained a quality venue for the people of our area to enjoy the wonderful winter sports of skiing and snowboarding. 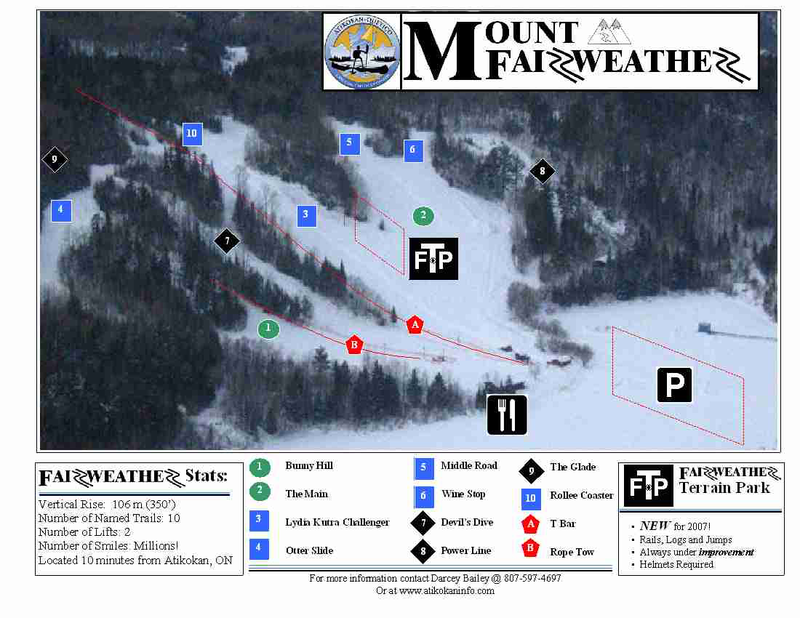 A new addition in 2007 is the Fairweather Terrain Park (FTP for short). Riders can test their skill on rails, jumps and other challenging obstacles. 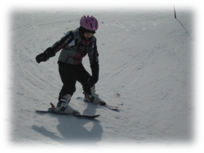 Atikokan can be proud to call Mount Fairweather its home to skiing and snowboarding. miscellaneous demo equipment, friendly and cozy atmosphere. Mount Fairweather is open weekends and holidays from late December to late March (or longer, depending on the gifts from Mother Nature. Atikokan's Cross country Ski Club has an open invitation to all nordic skiers (or want to be skiers) living or traveling in Northwestern Ontario. The Beaten Path is a volunteer club that has created a great system of trails that will appeal to skiers of all levels and abilities. There are 35 km. of groomed trails for skate and classic five minutes from town. There is another 35 km of wilderness trails 25 minutes away in Quetico Provincial Park. Come out and enjoy Northwestern Ontario's majestic winter scenery on a truly wilderness trail system. 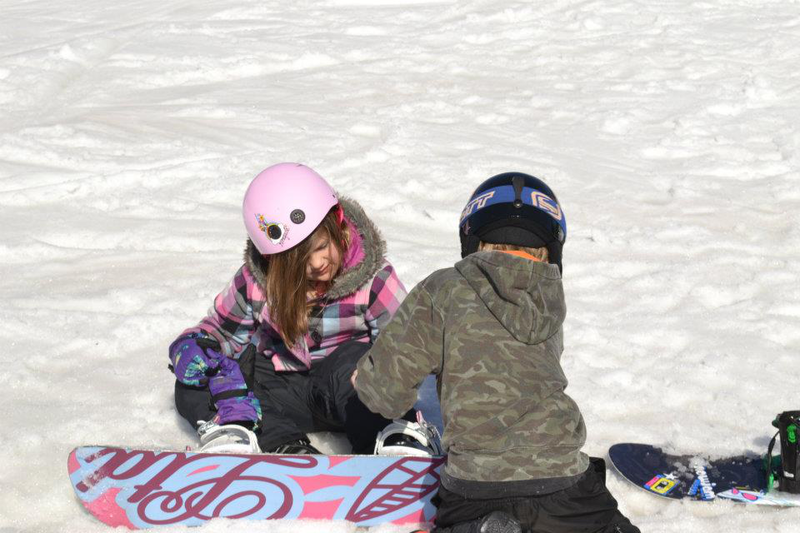 Our Jack Rabbit Program for skiers up to 12 years has a proven track record with many smiling new skiers. Youth program costs are $20 and are tentatively held on Sunday at 1pm. Membership costs are $100 for a family and $50 for adults and $25 for students. Memberships can be picked up at Atikokan Pharmacy or by calling Renee Matichuk: 1-807-597-4582. Annual Events The Sawmill Lake Classic-mid to late January The Chocolate Cup Challenge-mid February The Cross Quetico Lakes Tour- mid to late March Trails are open any time Mother Nature permits. All are welcome but memberships and/or donations are appreciated. For information about trails, trail conditions and upcoming events, visit the Beaten Path NordicTrails site.